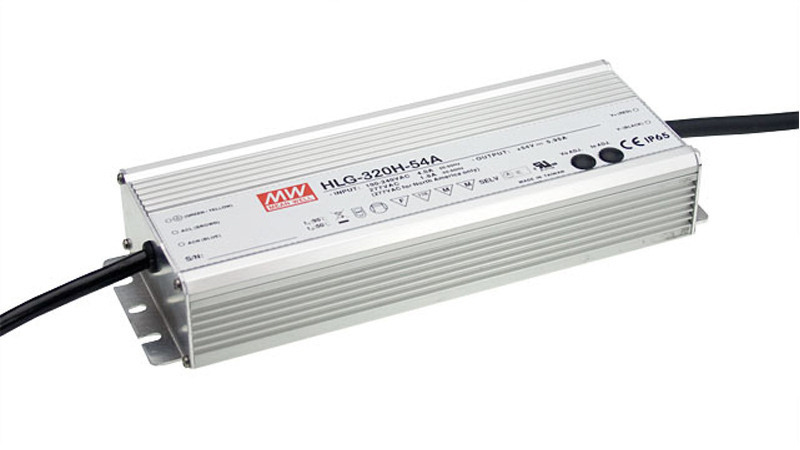 The latest generation of the HLG-series are exceptional, high performance LED power supplies. The "A" type of model HLG320-H, with adjustable voltage and current, can be used to provide power in many thermoelectric applications such as cooling/warming outdoor enclosures. 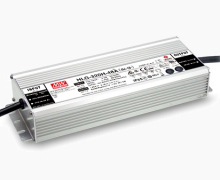 HLG320-H are 320 Watt, highly efficient, waterproof, LED power supplies, primarily for lighting applications. With a 90~305VAC wide AC input range the HLG320-H series will naturally operate with general 115VAC or 230VAC main input, but can also be operated with 277VAC allowing for operation in 277 Volt circuits for lighting in industrial and commercial 277/480-volt systems in North America. To operate reliably in harsh outdoor environments, each unit is built with an aluminum case, fully potted by heat-dissipating glue that complies with IP 65/67. For flexible installation in various types of applications, input/output can be cable type, that is waterproof, or terminal block that is not. With state-of-the-art LLC topology and synchronous rectifier technology the HLG320-H series are remarkably efficient (up to 95%) so can be cooled by natural (free air) convection. They have a very wide ambient temperature operating range of -40 ºC to +70 ºC that meets the requirements for almost all outdoor installations. Standard functions include protection for short circuit, over voltage, overload, and over temperature. The HLG series is capable of operation in “constant current (C.C. mode) plus constant voltage (C.V. mode).” This allows the supplies to direct drive the LED in order to increase the total system efficiency or, with the use of DC-DC LED driver, balance current distribution. HLG320-H have a high PF value, and IP65~IP67 dustproof / waterproof rating, the HLG series also has 4KV/ 6KV surge immunity and offers flexible dimming options. The HLG320-H Series is also available in 20 Volt, 30 Volt, 42 Volt and 54 Volt versions. The basic or “Blank Type” is IP67 rated and has all the basic features without the ability to make voltage and current adjustments. The HLG320-H Series have global certificates for, and comply with, UL / CUL / TUV / CB and CE including UL8750, EN61347-1, and EN61347-2-13 lighting related regulations. Meeting these requirements assures your equipment will meet global safety and EMC regulations. These high efficiency power supplies are very suitable for LED street lighting, LED high-bay lighting, outdoor electronic display, LED decorative lighting, indoor/outdoor LED lighting, LED tunnel lighting, and many other outdoor electronic installations with moisture and or dust, such as outdoor mechanical or electrical equipment and telecommunication base stations. "A Type" HLG320-H supplies can be used as the power supply for many thermoelectric applications.